Three years after the California Legislature invested nearly $13 billion into schools through the Local Control Funding Formula, it’s still unclear where those dollars are going. That’s the conclusion of The Education Trust–West’s new report, which reviews the second-year Local Control and Accountability Plans from 40 school districts. The analysis focuses on the budget information presented in these plans. It finds that LCAPs lack fiscal transparency and fail to convey if supplemental and concentration grants generated by low-income students, English learners, and foster youth are indeed reaching those students. In most cases, it is impossible to trace if supplemental and concentration grants were used to increase or improve services for high-needs students. Most districts account for less than half of their budgets in their LCAPs. Conversely, some districts account for more than 100% of their budgets, in part because they double-count line items. In districts that do show how they are using supplemental and concentration funds, we see both promising practices and concerning trends. Some districts are clearly using dollars to positively serve English learners, foster youth, and low-income students, as LCFF intended. But in some cases, districts appear to be using funds in ways that are contrary to the spirit of the law. Many districts appear to be underspending supplemental and concentration dollars, relative to what they proposed the prior year. Underspending these targeted dollars may deny students the services to which they are entitled. 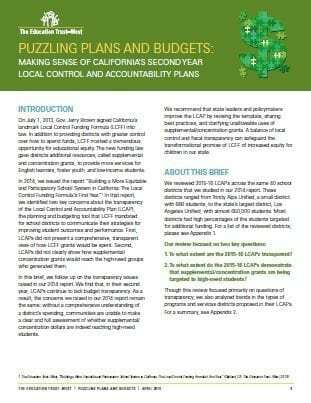 The report provides suggestions for how the state can fix the LCAP template, increase budget transparency, and strengthen assurances that high-needs students will benefit from LCFF’s targeted dollars.